With Cloud Bands And Arabesques, the pair continue to develop the lush electronic soundscapes, crisp beats and evocative melodies that characterized their debut release, which also occasionally incorporates elements of acoustic instrumentation. The album was recorded in Fisher’s studio in London and is filled with moods and atmospheres collected around east London. Over the course of this collection, the pair create a clair-obscure universe with delicate impressionist touches, at times vaporous and fluid, from the shifting drone formations of opening piece October Mist, which overflow onto the shimmering textures of Three Ten To Euston, or the soft summery tones of What Colour Is Your World? to the earthy grain of Forests Of Glass And Steel, at others more clearly defined and concrete, whether it is the kaleidoscopic Formless Geometry and Butternut Squash, the off-kilter folk of A Tree Without Birds or the sticky funk of Clockwork Pharmacy. But while the overall mood of the record appears particularly chilled, it actually changes with every track as Bolton and Fisher combine their individual sound into a rather eclectic soundtrack. Despite often appearing straightforward, the pieces presented here are often complex constructions built around intricate rhythmic patterns and particularly evocative soundscapes, and serve beautiful melodic themes. This is an approach that both artists have developed through their respective work, but it takes on a different aspect here. Cloud Bands And Arabesques is often quite difficult to pin down for definite, its many influences assimilated into a very individual sound. 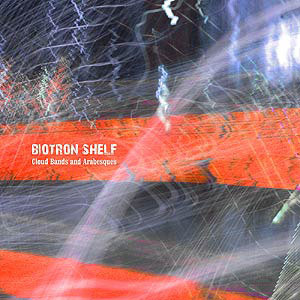 With this record, Biotron Shelf have created a particularly effective collection of timeless electronica.